Add a ZIP to your trip, it’ll be one exhilarating ride! Five-station, dual-cable zipline and freefall platform with a total of 3,520 feet of side by side riding fun! 3 miles from Yellowstone. 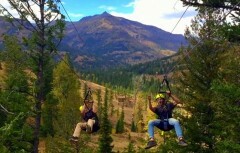 Experience our mountain scenery in a whole new way! Cafeteria and bar available. June 15-September 15: daily, 9AM-6PM. Please visit website for pricing and further information. Reservations recommended.